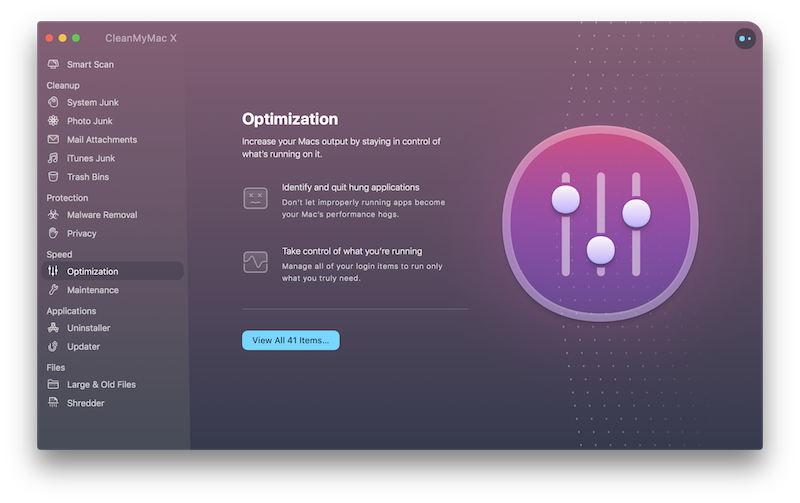 CleanMyMac defines the sources of possible performance drop and gives you control of what is running on your Mac. Login Items, which are automatically launched every time you boot your Mac. Launch Agents, which extend the functionality of the parent app but may be resource-consuming. Hung Applications, which stopped responding due to some problem. Since these apps are likely unusable at this point, CleanMyMac can shut them down to reduce system loads. Heavy Consumers, applications that extensively use resources of your Mac, in particular, of CPU. You may decide to quit them to distribute capabilities of your Mac more effectively. Each login item and launch agent has Enable or Disable status next to it. So, if you want to turn an extension on or off, just click the status and see it switched. If you want to remove an item in Login Items and Launch Agents completely, select it and click Remove (or Perform). Please mind that you will not be able to undo this action. However, if you disable an item, it can be easily turned on. When CleanMyMac detects apps that affect performance of your Mac or eat out much system resources, it shows them in the corresponding submodule of the Optimization module. You can quit troubled apps right from Hung Applications and Heavy Consumers: select an application you’d like to shut down and click Quit. Also, you may prefer to restart a heavy-consuming app to reduce its resource consumption. To do it, hover over the app in Heavy Consumers and click on the Relaunch. Some items are marked with info signs and do not have checkboxes. These items can be removed only along with the associated applications or services. Yet, you can easily disable or enable them.